This year, our travels focussed on ‘searching for’ the Via Francigena, a medieval pilgrim route from Canterbury to Rome. The pilgrimage is based on a diary written by Archbishop Sigeric when he travelled to Rome in 990 AD to receive his Pallium from the Pope. On his way home, he recorded the ’80 mansions’ where he stayed overnight. This diary forms the basis of today’s pilgrim route. The pilgrimage covers a distance of 1900 km and it takes 3 months to walk! The pilgrim carries a Credential which is stamped at each overnight stopover. It is proof of completing the pilgrimage. And, it entitles the pilgrim to receive a Testimonium upon arrival in Rome. The pilgrim can start anywhere along the Via Francigena route, or use any mode of transport. But, the last 142.2 km from Acquapendente to Rome must be walked to receive the Testimonium. There are several reasons for my interest in the Via Francigena. Firstly, my daughter lives right in the heart of the Via Francigena in Switzerland. So I am very familiar with Sigeric’s Swiss stopovers. Also, I have a passion for Castles and Cathedrals! And there are plenty to see along the way. Mostly, I was deeply curious to see how the spiritual nature of the journey unfolds. Ultimately, I was quite sure this journey would be full of ‘accidentally cultured’ experiences. This story is all about the magic moments of self-enlightenment that happen on a pilgrimage. Our pilgrimage was totally unplanned. And in true ‘accidentally cultured’ style we just let it unfold, trusting that this journey of faith would present us with exactly what we needed. We were fortunate to begin our pilgrimage in Canterbury. But, Canterbury Cathedral Lodge, the ideal place for the first Sigeric stopover was fully booked. So, we settled on the Marquis, near Dover. Now, this Hotel describes itself as a restaurant with rooms attached. And indeed it was! So, we indulged in mouth-water degustations of local Kent produce two nights in a row! But, we did have to drive to Canterbury to begin our pilgrimage. ‘I am not driving to Canterbury Cathedral! It is one hour and twenty minutes away!’ Paul (Accidentally Cultured, or AC for short) announced after playing with the GPS for about 15 minutes. Surprised to encounter traffic in these country lanes, I contented myself with gazing at the cows and meadows. So we ended up in a Marks and Spencer’s parking station. Then we wandered through the medieval streets of Canterbury until the spires of the Cathedral appeared. The Christ Church gate is the entrance to the Cathedral. And as I walked beneath Christ in his glory with the angels I really felt like a pilgrim. However, I had no idea how to begin our pilgrimage. We hurried into the Cathedral to escape the rain. 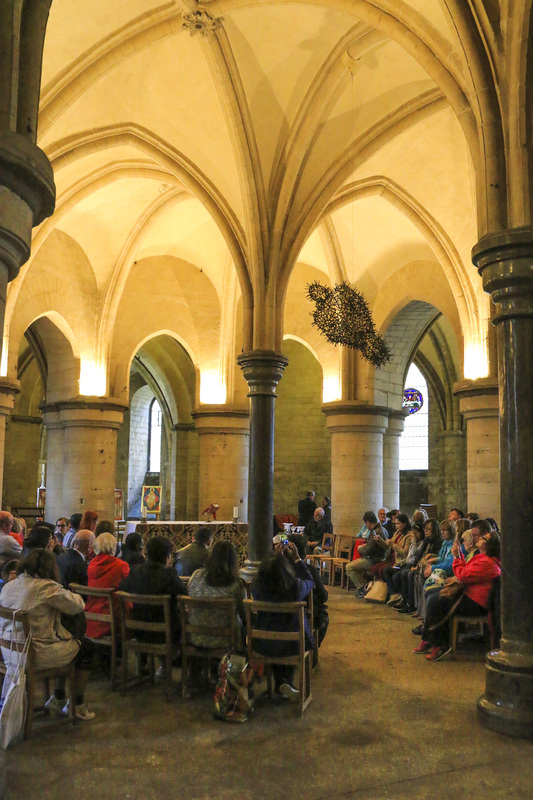 And, I was delighted to discover there was a Mass for Pilgrims in the Crypt. So, I decided the Via Francigena must be big business! Then, we hurried to the Crypt, joined in the Mass, went to Communion and even sang ‘Soul of my Saviour’! I was very eager to meet fellow pilgrims. So, I was quite disappointed to discover they were not Via Francigena pilgrims at all. They were a group of English parishioners with their Parish Priest making a pilgrimage to the Cathedral. However, they were very friendly and let us join their guided tour! 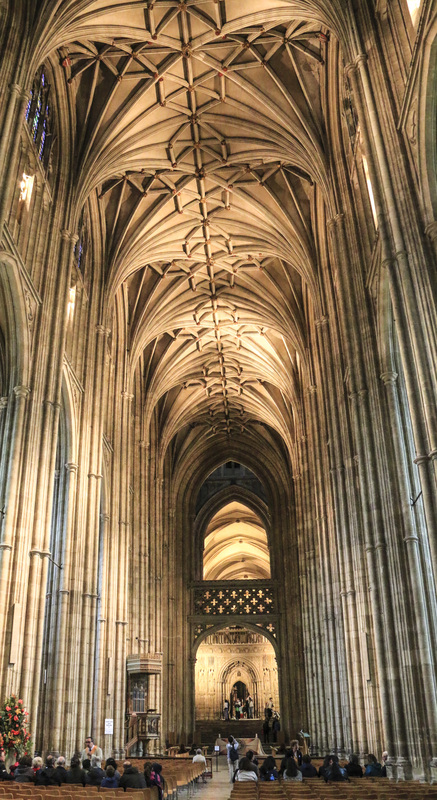 Canterbury Cathedral has a long history! Missionaries came from Rome to convert the King of Kent to Christianity in 597 AD. Their leader, Augustine, became the first Archbishop of Canterbury. And, a wooden Saxon building was the first Cathedral. Then, William the Conqueror had it rebuilt in Romanesque style in 1066. Later, the two bell towers and nave were added in English Perpendicular Gothic style in 1377 to 1405. Then, many other changes were made over the centuries. Gratefully, the Cathedral has managed to survive both Puritan destruction and the bombings of WWII. 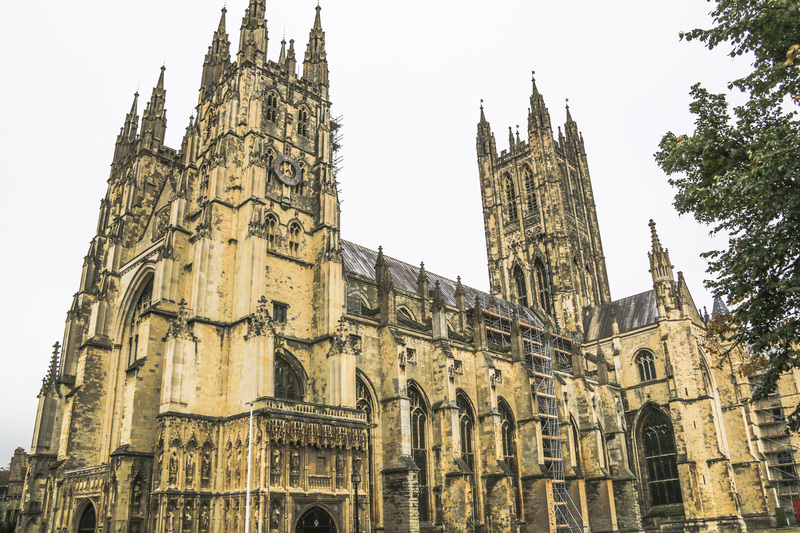 For much of its long history, Canterbury Cathedral has been a place of pilgrimage. Thomas Becket was murdered here by four knights. Consequently, his blood became a holy relic and a pilgrims came hoping for a miracle. Today, there is a broken sword sculpture marking the place where he was murdered. The exact location of Beckett’s tomb is unknown. But, it is thought that he was buried between 1170 and 1220 in the Crypt were we attended Mass. As a result, I found it a bit spooky when Gormley’s ‘Iron Nails’ sculpture of Becket started moving around during the Mass. There is such an enormous amount to see at the Cathedral. But AC was getting very hungry! ‘Can we go to Dover now? I am hungry!’ was all he had to say. Sadly, I began to say goodbye to my Via Francigena pilgrimage hopes. And, I had searched in vain in the bookshop for information about the pilgrimage. So we decided to head back to the Christ Church gate past a tour guide window. With great excitement I discovered Via Francigena posters! So I hurried to the tour guide window and asked about the posters! ‘The only thing I have is these ‘Credentials’. said the young lady at the window. We were very excited when she stamped our Pilgrim Credentials! 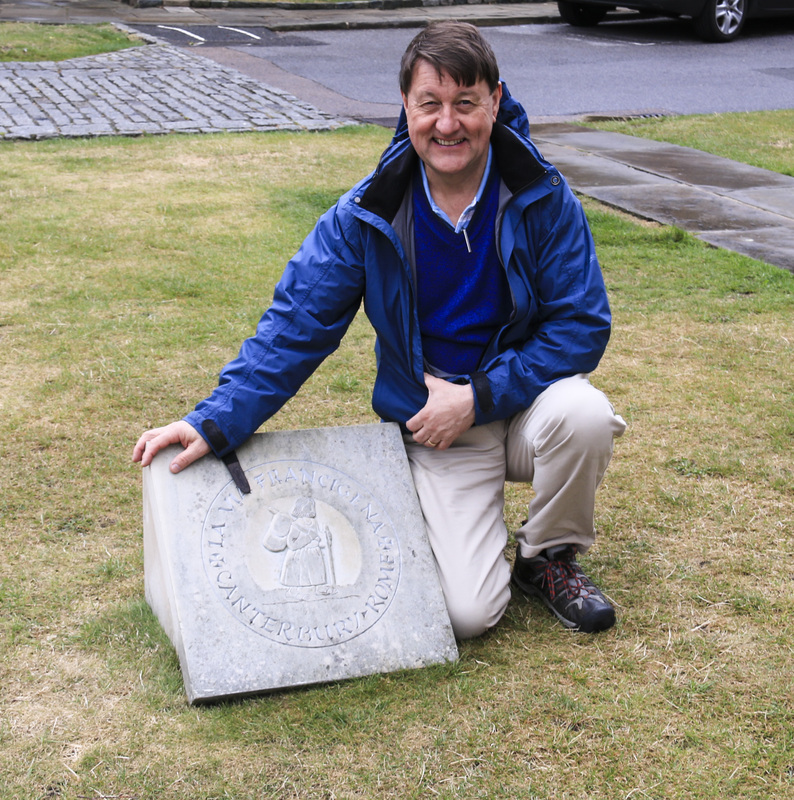 Then, she pointed out the milestone on the ground near the Cathedral entrance. At last, our pilgrimage had begun! And so, we said our goodbyes to the great Cathedral and headed off to Dover! We met our daughter and her husband at Dover. And AC was extremely happy to leave the hire car behind and pile into the back seat of their car. Then, we crossed the English Channel on the car ferry. As the ‘White Cliffs’ slowly disappeared from sight I tried to imagine what type of boat Sigeric must have travelled in. Then, I noticed that AC was feeling ecstatic because he didn’t have to drive (or walk) to Switzerland! It was such a shock to drive off the car ferry in Calais and see double razor wire fencing enclosing the refugee camps. Calais has a long history political torment due to its proximity to the English coastline. And today is no exception! The enormous Gothic Cathedral dominates the skyline to the right. And, my imagination was running riot wondering how Calais would have looked to Sigeric. Back then, there were no Gothic Cathedrals, only the well worn tracks that are being newly rediscovered today.